PTS-500 malignant pleural effusion - Products - Gongwin Biopharm Co., Ltd.
Malignant pleural effusion (MPE) is the buildup of fluid and cancer cells between the chest wall and the lung. 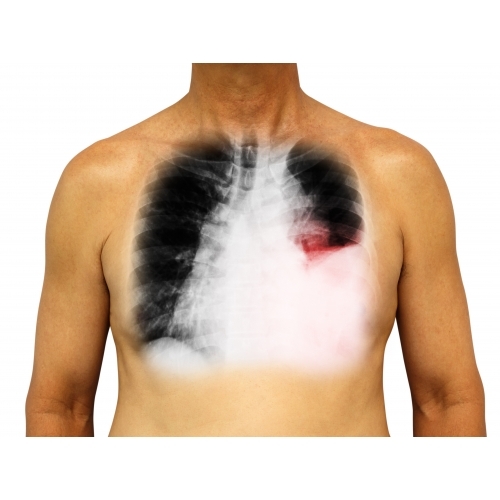 Depending on the degree of malignancy, a great amount of fluid may compress lung causing dyspnea, cough and chest pain and severely reducing patient’s quality of life. Approximately 50% of patients with mid- to late-stage cancer tumors develop complaints of dyspnea related to MPE in the course of their disease. High morbidity cancer like lung cancer and breast cancer account for about 50-65% of MPE. Once MPE is diagnosed, depending on the cause of malignancy, the average survival period is between four to seven months. The treatment of MPE is aimed at palliating symptoms and maintaining life quality since no intervention has been shown to improve survival in this population. The current recommendation for MPE management is pleurodesis by chemical (talc or other agents) or physical (indwelling pleural catheter, IPC) approach to obliterate the pleural space for MPE accumulation. Care must be taken to control the particle size of talc to avoid complication such as acute respiratory distress syndrome (ARDS); IPC would require weeks before successful pleurodesis may take effect, and risks of infection have been reported. In either case, pleurodesis leads to adhesion between the parietal and the visceral layers of the pleura without killing the cancer cells in the pleural cavity. Therefore a safe and effective option to treat MPE is still in need. PTS is administered the same way as the agents for chemical pleurodesis, that is, to complete MPE drainage and instill PTS via the same chest tube. The primary animal and human studies reveal that compared to current pleurodesis, PTS inhibits tumor cell growth and MPE accumulation without causing pleura adhesion. Gongwin has been planning a Phase II, multi-center, open-label clinical trial. The goal is to evaluate the safety and efficacy of PTS on MPE patients. Some patients will be recruited in clinical study sites located in Australia. 1. Fenton KN, Richardson JD., Diagnosis and management of malignant pleural effusions. Am J Surg 1995;170:69-74. 2. Feller-Kopman DJ, et al. Management of malignant pleural effusions. An official ATS/STS/STR clinical practice guideline. Am J Respir Crit Care Med. 2018 Oct 1;198(7):839-849.